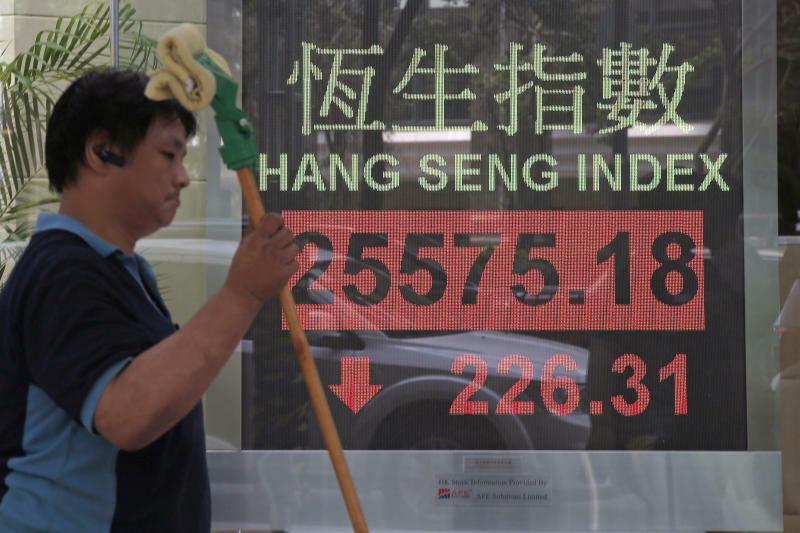 TOKYO (AP) — Asian stocks slipped Monday, as investor worries continued about global trade tensions and prospects for economic growth. KEEPING SCORE: Japan's benchmark Nikkei 225 dipped 1.2 percent to 22,426.32, while Australia's S&P/ASX 200 slipped nearly 1.1 percent in early trading to 5,832.00. South Korea's Kospi inched down 0.2 percent to 2,156.56. 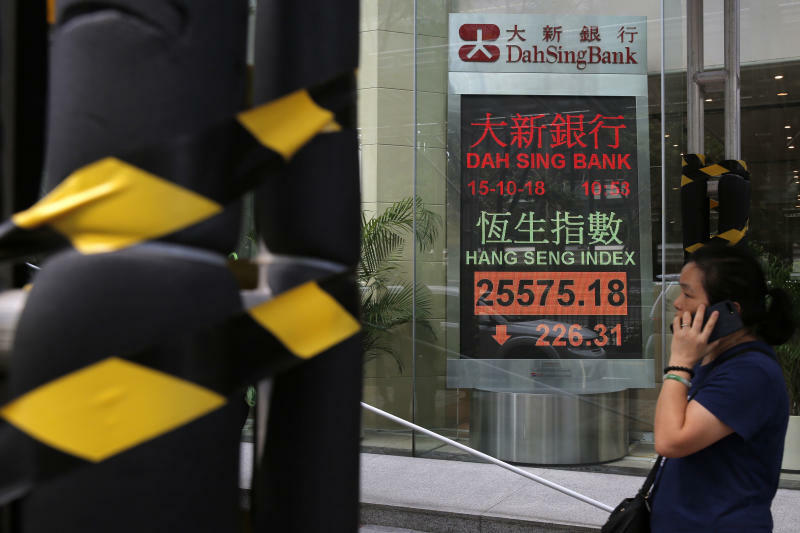 Hong Kong's Hang Seng fell nearly 1.0 percent to 25,553.41, while the Shanghai Composite edged down 0.4 percent to 2,597.15. WALL STREET: The S&P 500 index rose 38.76 points, or 1.4 percent, to 2,767.13 to end a six-day losing streak last week. The benchmark index tumbled 4.1 percent during the week, and it's down 5.6 percent since from its latest record high, set Sept. 20. The Nasdaq composite jumped 167.83 points, or 2.3 percent, to 7,496.89. The Dow Jones Industrial Average finished with a gain of 287.16 points, or 1.1 percent, at 25,339.99. TRADE WORRIES: Investors are growing worried that U.S.-China trade tensions are impairing global economic growth. The International Monetary Fund cut its forecast for global economic growth last week because of trade tensions and increased interest rates. 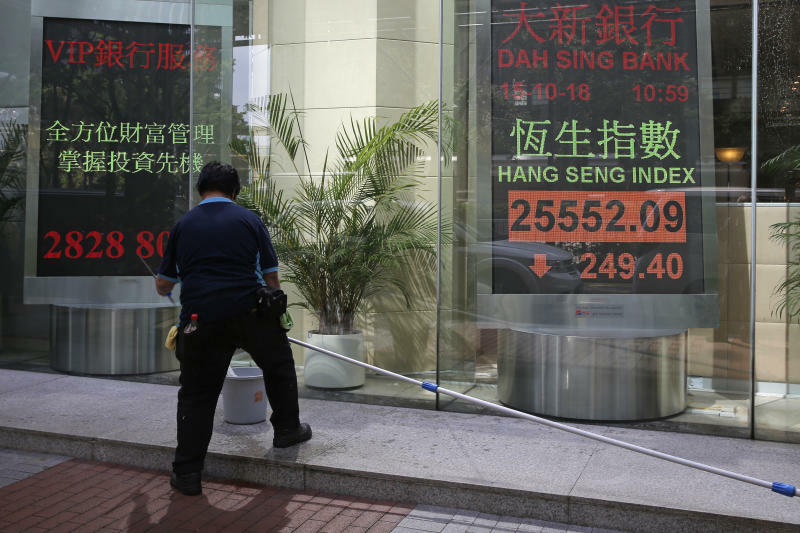 THE QUOTE: "The repercussions of trade tensions that had plagued global equity markets persist," said Jingyi Pan, market strategist at IG in Singapore. CHINA MEETING: News that Chinese President Xi Jinping and President Donald Trump may meet have set off some hope that tensions in the trade war between the world's two largest economies might ease. But worries about the increased tariffs the two sides have imposed on each other's goods, a move that tends to dampen growth, are contributing to volatility in financial markets. ENERGY: U.S. benchmark crude gained 79 cents to $72.13. It added 0.5 percent to $71.34 a barrel in New York Friday. Brent crude, the international standard, added 98 cents to $81.41. CURRENCIES: The dollar slipped to 112.14 yen from 112.33 yen late Friday. The euro fell to $1.1553 from $1.1602.